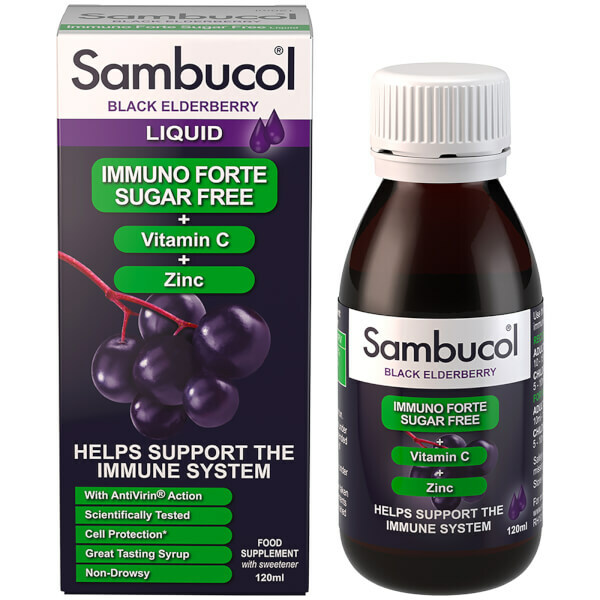 Take care of yourself all year round with Sambucol Immuno Forte Sugar Free, a food supplement syrup containing antioxidant-rich Black Elderberries. Delivering AntiVirin® action (a proprietary term believed to help inhibit the spread of the flu virus), the scientifically tested, daily supplement is free from added sugar and helps support the immune system; the immune system is designed to defend the body and fight infections. With added Zinc and Vitamin C, the delicious tasting, antioxidant-rich syrup is an easy and enjoyable way to help you stay healthy all year round. Suitable for vegetarians and vegans. Scientifically tested. Free from gluten, alcohol and artificial colours. No added sugar, yeast or milk derivatives. 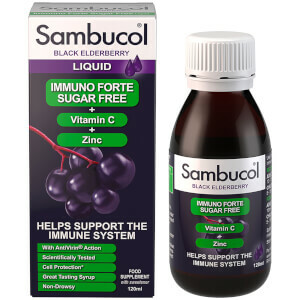 Black Elderberry Juice (Sambucus nigra) (AntiVirin®), Sweetener: Sorbitol, Vitamin C (Ascorbic Acid), Flavouring: Raspberry (Rubus idaeus), Acidity Regulator: Citric Acid, Zinc Gluconate, Preservative: Potassium Sorbate.